Quizical expressions. Shrugged shoulders. Muttered swearing. 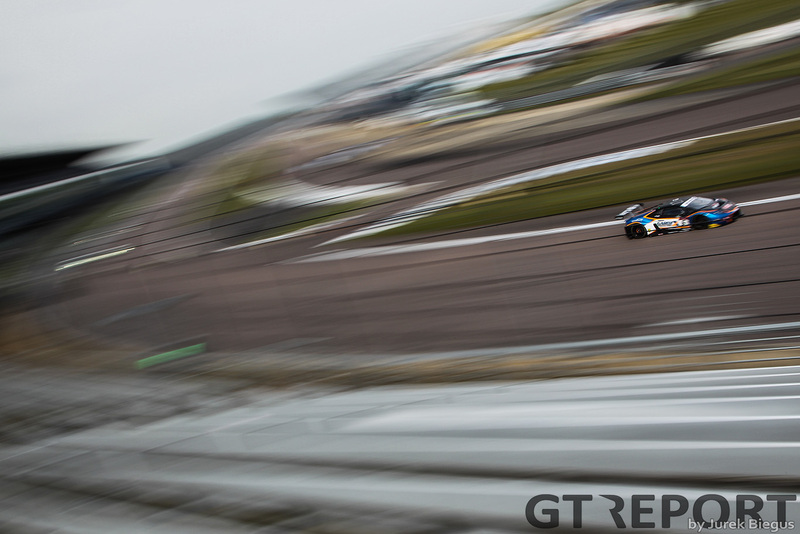 It’s fair to say that the first two-hour British GT race of the season at Rockingham caused some confusion in the media centre all stemming from a five second time penalty that allowed one car to break free and build a 30 second lead. 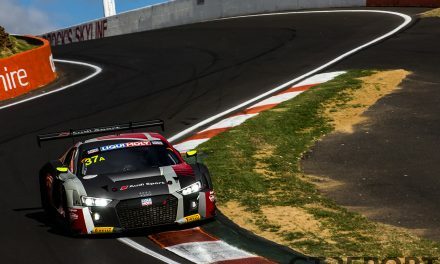 With less than 30 of the scheduled 120 minutes left to run Matt Griffin, in the Spirit of Race Ferrari 488, had one objective – build a five second gap over Seb Morris in the Team Parker Bentley Continental to negate the time penalty given to Duncan Cameron in the first hour. It appeared his battle would be in vain as a safety car was called for and the pack squeezed together. 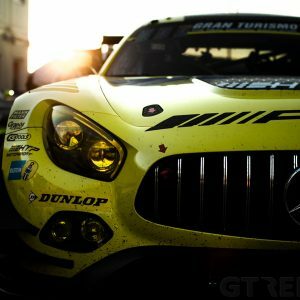 However, and this is where the swearing confusion began, due to a quirk in the MSA rulebook while Griffin was the leader on the road the timing screens showed him in fifth – because the time penalty had been applied during the race. That meant the Ferrari was given a wave around and allowed to catch back up with the pack, in reality though the Irishman used the opportunity to power round the NASCAR banking of Rockingham and into a handy lead. 30 seconds long by the time the safety car came back in, Morris had no chance of reeling the green and white Ferrari back in by the time the chequered flag went out and he would finish 25 seconds down. 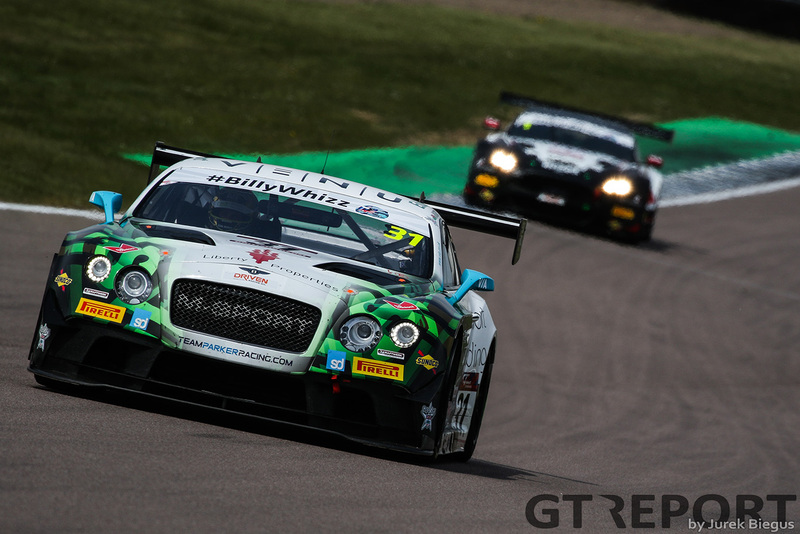 But to add another twist to the story, an investigation was launched into contact when Griffin passed Morris on track before the safety car and a 26 second penalty was slapped on the Griffin-Cameron combo – relegating them down to second and giving the Bentley crew of Morris and Rick Parfitt their first win of 2017. 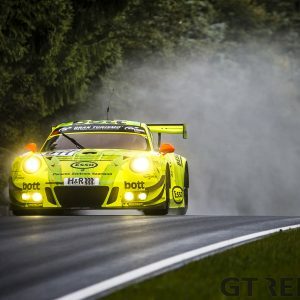 Behind all this, and in the first hour of the race, was a great battle from a team still properly getting to grips with GT3 racing – Macmillan AMR. At the wheel of the team’s Aston Martin V12 Vantage, James Littlejohn and Jack Mitchell were on fire. 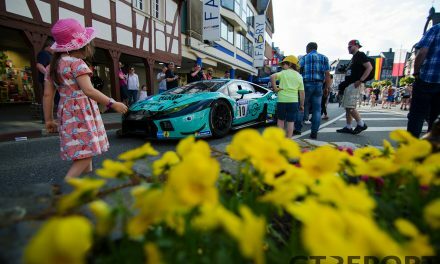 Starting ninth on the grid, they’d made up six places by the time the field filed through at the end of the first lap and onto the coat tails of Jon Minshaw in the Barwell Motorsport Lamborghini Huracan GT3. Minshaw held off Littlejohn for a time, but the former Radical racer knew he had the speed on the banking and going into the Deene hairpin he lunged up the inside of the Lamborghini and moved into the lead. It was a good weekend generally for the Aston Martin teams as TF Sport locked-out the front-row in qualifying. 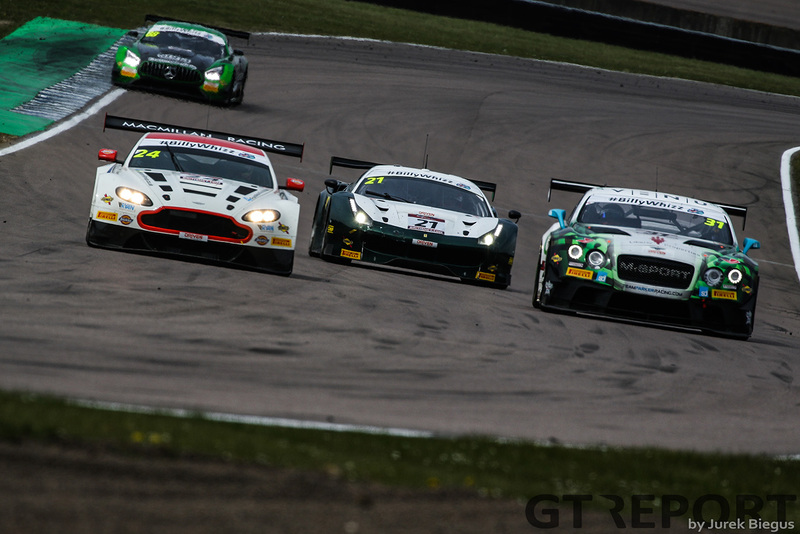 However, unlike Macmillan they wouldn’t have the same pace in the race as Derek Johnston in the number 1 and Mark Farmer in the number 11 both struggled to match the front-running pace and slipped down the GT3 order as the race approached the pit window. Coming out of the pits, the battle at the front was between Morris and Griffin but behind Jack Mitchell in the Macmillan Aston was being battled to the very limit by Phil Keen in the Lamborghini which had an engine change after free practice one. Holding Keen for the whole race, Mitchell would cross the line in third with just a car length in hand over Keen who himself was doing wonders to hold of Sam Tordoff in the second Barwell Huracan. 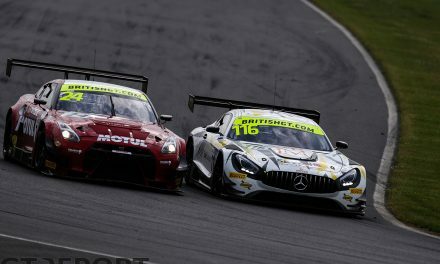 The GT4 class was having none of the dramas of its big brother and was instead having a great scrap between a number of different marques. Setting off from pole position the HHC Motorsport Ginetta G55 of Will Tregurtha and Stuart Middleton got robbed of their lead by the Black Bull Garage 59 McLaren 570S of Ciaran Haggerty and the Lanan Racing Ginetta of Alex Reed as the field bunched up at Deene. From there, a battle raged to see who can stay out in the lead the longest and as the pit window opened on the hour mark, Tregurtha stayed out for as long as possible to build up a gap to Sandy Mitchell in the McLaren and David Pattison in the Lanan Ginetta. 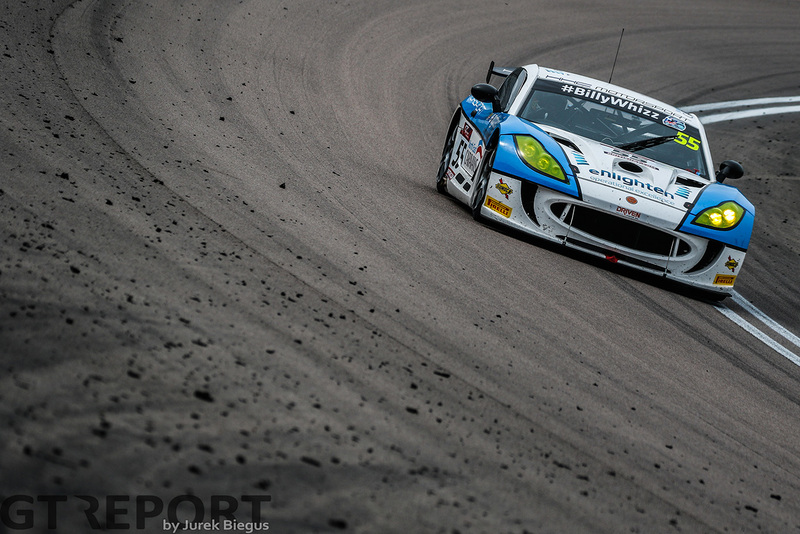 That strategy appeared to pay off as Middleton got in a car with a handy lead and powered off into the distance as Mitchell had his hands full with reigning GT4 champion Mike Robinson. 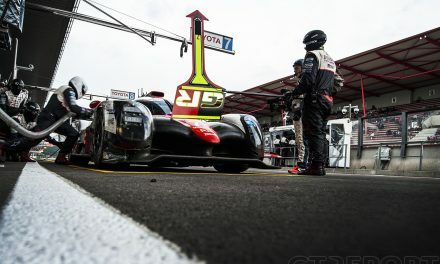 The pair finished second and third respectively behind Middleton, with the second Garage 59 finishing a season best of fourth at the hands of Dean Macdonald and Akhil Rabindra. One McLaren not having the best day was the winner’s of the first race at Oulton Park – track-club. Adam Balon barely got comfortable behind the wheel before a piece of debris punctured the charge cooler in the McLaren’s engine. 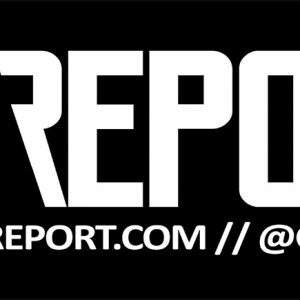 The next time the grid will be back out is for another one-hour double header, this time at Snetterton where there’ll hopefully be less confusion.